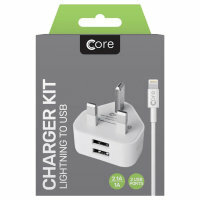 Charge your Apple devices quickly and conveniently with this 2.4A high total power output, dual port UK charging kit. The bundle includes a dual port charger, as well as Lightning to USB cable. The included cable supports both charge and sync. We are currently awaiting stock for this item. If an estimated stock date is displayed, please be aware we do everything possible to ensure they are as accurate as possible, however due to circumstances beyond our control - they may be subject to change so please check back regularly for the latest information. Does just what I wanted - so very pleased to have found it on MobieFun! Another good buy from mobile fun. It's a plug with USB connections! It's fine! Nothing, I knew what I was buying! With an ever-growing number of devices in each household, having a charger which can simultaneously be used to charge multiple devices is a blessing. Dual Port USB Apple Power Kit can charge two devices at the same time, keeping the cable clutter to the very minimum. It is also worth mentioning that the Dual Port USB Apple Power Kit is able to push through and deliver a total of 2.4A current to the two power output ports, which is enough to quickly charge your iPhone's, iPad's or iPod's battery. Despite featuring two USB ports for charging cables, the charger itself is very compact which makes it highly portable. This will be perfect for both the frequent travelers and professionals who spend most of their time on the go. There is nothing better than getting some freebies! 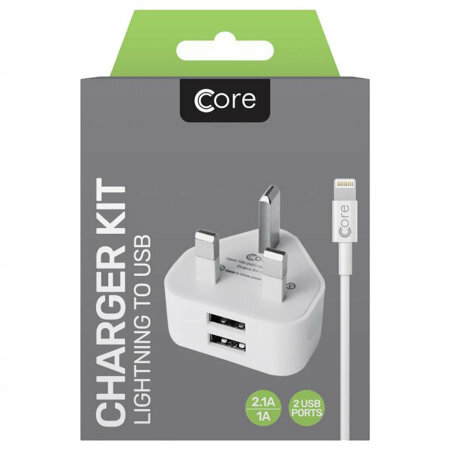 This Charging kit comes with a removable 1m Lightning to USB cable, which you can use to charge your compatible Apple devices. Moreover, the cable supports data transfer protocol, meaning you can also use it to sync your data with your PC or MacBook. The mains charger features a universal USB-A charging port, allowing you to charge Lightning, Micro USB, USB-C and other devices with your existing charging cables. This may be your camera, MP3 player or any other device - this charger has got your back! products take care of your safety by offering a short circuit and overload protection, whilst charging. This ensures the appropriate power output is used to charge your devices safely and efficiently, preventing it from overheating and catching fire.